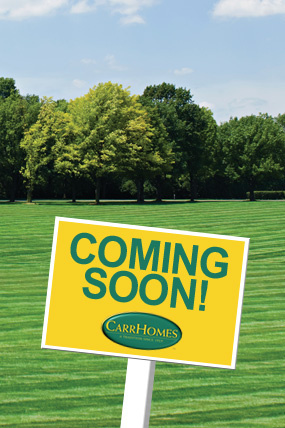 November 29 – So here we are a builder, CarrHomes, with a new single family home community in Herndon, Virgina–Shaker Knolls, about to get started. We tell our ad agency to put a “Coming Soon” sign-up page on our web site, but not to give out info like pricing or floorplans, cause, well, we’re just not ready yet. So you, the prospect, have got very little information about plans, pricing, even the exact location. You’re fearful of all the promo emails you’re probably going to get. And there’s really no hurry. Where’s the motivation? You can just wait for a finished model model, right? Being the first means you’re guaranteed a choice of the best lots and exposures. You can pretty much choose whatever elevation you want, not one we just pick out for a lot or one we have to decline cause somebody else put it up right next to your lot. You can have us build in all the finishes and upgrades over builder standards you want, so the home fits exactly with your lifestyle. Your home will probably be completed quicker since there won’t be other homes being built in front of you. You can count on us being more eager to accept initial contract offers because we want activity on the site as soon as soon as possible. You can be sure your email won’t be given out to anyone else (at least with us). You’re too important to us, now and in the future. And here’s the best reason: most builders will price their preview products lower than opening prices to test the market acceptance, cause its easier to raise a price than to lower one. So, you’ve got to ask yourself, are a few promo emails worth getting the home of your dream on the lot of your choice with the exact finishes and upgrades you want? 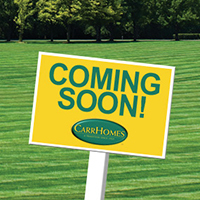 If you agree with us, check out our Shaker Knolls sign up page at CarrHomes.com. And, if you don’t we’d like to hear why.